VirtualBox is a free hypervisor currently being developed and maintained by Oracle Corporation. While perhaps lesser known, it’s a direct competitor to VMware WorkStation and Microsoft Hyper-V. In July 2017, we started receiving vulnerabilities in VirtualBox 3D acceleration functionality, which is implemented with the Chromium library. Oracle warns in their documentation against enabling 3D Acceleration due to the security implications it imposes and the attack surface it exposes. What few know is that the code behind 3D Acceleration is very old. And by old, I mean it almost dates back to 2001. Yes, 2001. In this blog post, I detail different types of vulnerabilities that we received through the ZDI program starting from July 2017. The first batch of vulnerabilities that we received were found by Vasily Vasiliev. Ever since then, research in this area has blossomed, and we’ve started receiving many more vulnerabilities in this attack surface. Because Chromium allows the rendering of OpenGL graphics, when 3D Acceleration is enabled, OpenGL apps will send rendering commands to the hypervisor, which runs the Chromium server. Selecting this option does not generate any warnings or dialog boxes providing any indication this option exposes a larger attack surface. 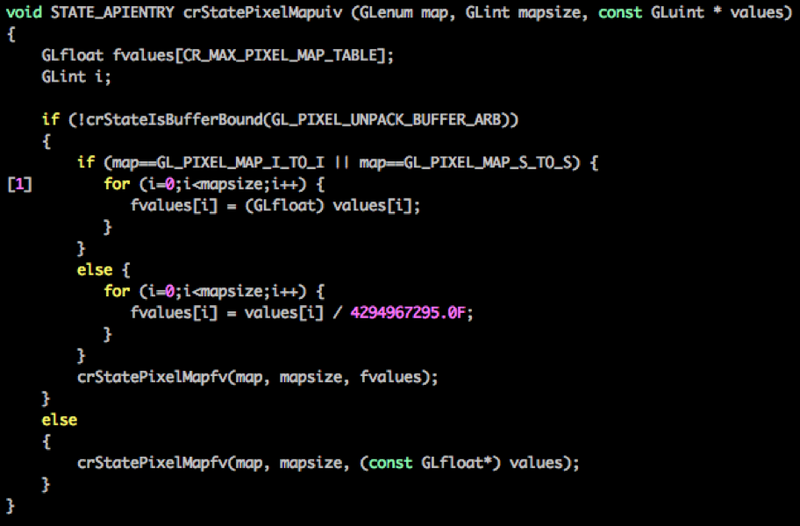 The bugs discussed below demonstrate different vulnerabilities affecting OpenGL rendering commands. The user has control over num. 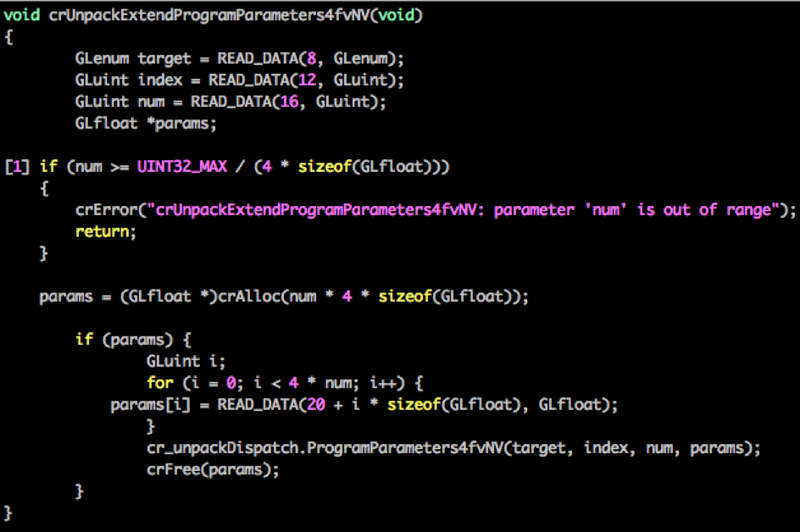 By sending specific values in num, an integer overflow occurs at  that forces a small allocation in params. Later at , num is used in a loop that overflows params. Oracle added a size check at  to avoid the overflow. The vulnerability was patched in Oracle’s April patch release and assigned CVE-2018-2830. Interestingly, this vulnerability was co-credited with another finder, Marche147 – an indication that multiple researchers are looking at the OpenGL attack surface. A very similar vulnerability (ZDI-18-686) with the same vulnerable pattern was found by (Root Object) Alisa Esage and fixed in the July patch release. At , address is used as an index to reference elements in the TrackMatrix array. In this case, address is user-controlled and can be used to perform an out-of-bounds write. An extra check was added at  to make sure that address does not exceed maxVertexProgramEnvParams. The vulnerability was also patched in Oracle’s April patch release and assigned CVE-2018-2835. The user controls mapsize and values. Later at , mapsize is used in a copy loop that eventually overflows fvalues. Oracle patched this vulnerability by adding a size check on mapsize at the very beginning of the function  to ensure that fvalues does not overflow later. The vulnerability was patched in Oracle’s January 2018 patch release and assigned CVE-2018-2686. Since n is user-controlled, an integer overflow can be triggered at  forcing a small allocation of pLocalprogs. Later at , n is used in a copy-loop that overflows pLocalProgs. 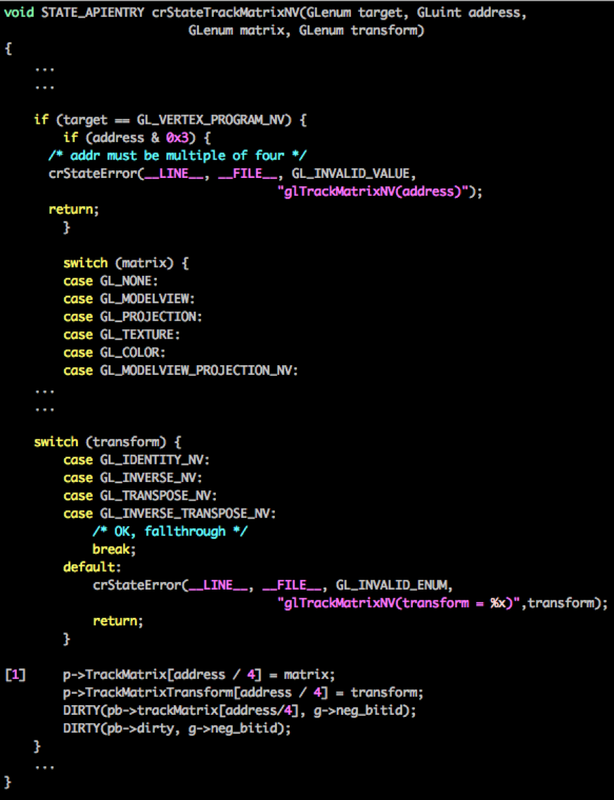 As expected, Oracle added a check at  to avoid the integer wrap at the crAlloc. The vulnerability was patched in Oracle’s January 2018 patch release and was assigned CVE-2018-2687. Here is the PoC code that triggers this vulnerability. The PoC works from Ubuntu guest VMs.